Young Song, CEO of ZeroDesktop, will showcase the company’s innovative ZeroPC cloud content management technology to a panel of influential judges at the SXSW Interactive Accelerator event. ZeroPC connects users’ cross-platform content stored in popular sites including Box.net, Dropbox, Evernote, Facebook, Flickr, Google Docs, Instagram, Picasa, SkyDrive and SugarSync, for access and management from one secure place. ZeroDesktop's mission is to continuously enhance ZeroPC with a suite of innovative features, productivity and collaboration tools that will enhance the user’s cloud experience with a secure way to find, access, manage and share their content with others. ZeroDesktop, Inc. today announced that it has been selected as a finalist in the Innovative Web Technologies category at the upcoming 2012 SXSW Interactive Accelerator event held March 12-14 in Austin, TX. One of eight finalists in the Innovative Web Technology category, ZeroDesktop was recognized by SXSW for its ZeroPC 2.0 cloud content management technology that enables people to gain control of their documents, emails, photos, videos, music and social content that have become scattered across multiple devices and cloud services. 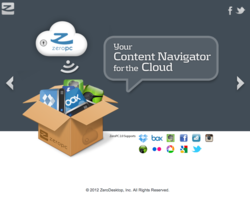 ZeroPC connects users’ cross-platform content in the cloud, making it easy to search, edit, move, share and backup everything from one secure place with one login. ZeroPC.com is a free service that features a universal search engine that lets users enter keywords, tags, names or places to easily navigate through all files, folders, documents, photos, videos, music and typically hard-to-find social content stored in popular sites including Box.net, Dropbox, Evernote, Facebook, Flickr, Google Docs, Instagram, Picasa, SkyDrive and SugarSync. All of the user’s digital content from these sites is managed under one roof in their ZeroPC cloud account. ZeroPC runs on popular browsers including Chrome, Firefox, Internet Explorer and Safari. In addition to the ZeroPC Web Desktop platform, tablet users can download ZeroPC’s “Cloud Navigator” app from the iPad App Store and Android Market. Officially launched in Q4’2011, ZeroPC currently manages over 250 million user documents, photos and other media files. South by Southwest (SXSW) is the annual music, film and interactive conference and festival. More than 670 companies submitted their Web-based products to the SXSW Accelerator that features the most innovative mobile technologies, social media and online advancements. 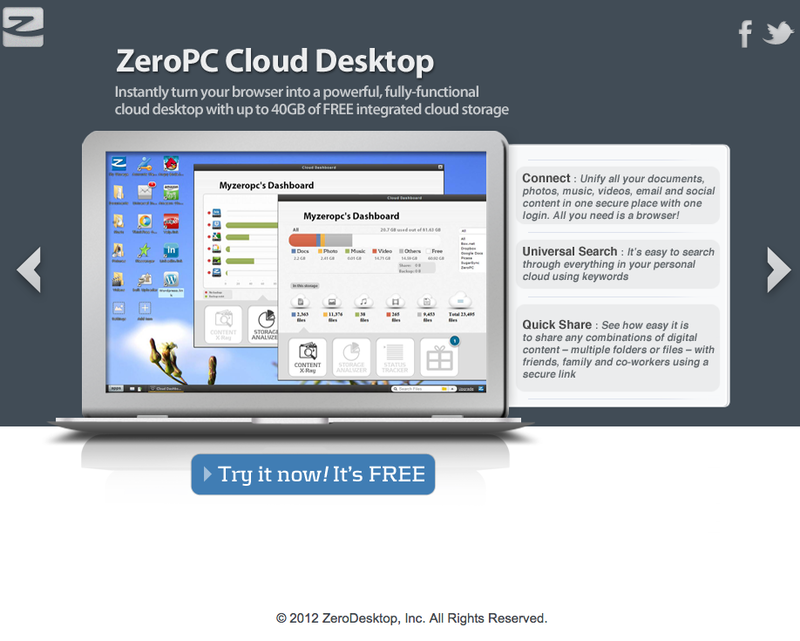 ZeroDesktop, Inc. (http://www.zerodesktop.com) is a global provider of Cloud Desktop solutions that change the way users share their digital content with friends, family and colleagues. ZeroPC is a revolutionary cloud content management user interface that turns a browser into a PC and empowers users to unify all of their digital content from PCs and Internet sites into one secure repository with a single login. ZeroPC provides the most comprehensive and functional Web desktop in the cloud with its rich combination of supported Web apps and native apps ranging from productivity tools and collaboration to social networks. Find ZeroPC on Facebook (http://www.facebook.com/pages/ZeroPC/123497937724818) and Twitter (http://twitter.com/#!/zerodesktop). ZeroPC instantly turns a browser into a powerful, fully-functional cloud desktop with up to 40GB of free integrated cloud storage. 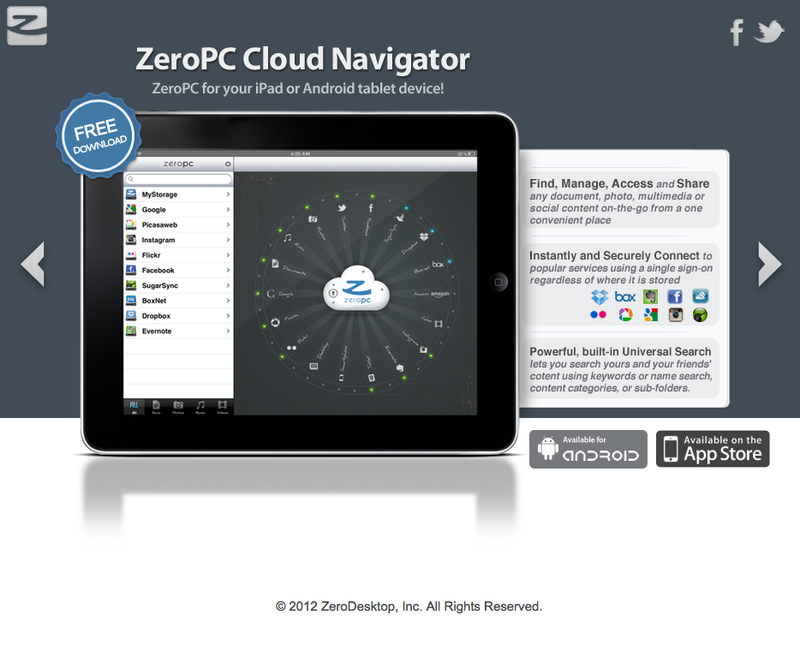 Tablet users can download ZeroPC’s “Cloud Navigator” app from the iPad App Store and Android Market.